They get quickly sealed & move ahead on conveyor & come out ready from the other end. 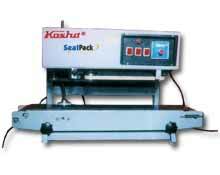 Ideal for large volume of pouch packing. Easy to use & low maintenance.